One day we decided to go further. A shepherd, in fact, had talked with us about a cave which, according to him, the lions used as a den and had offered himself to accompany us: it would take almost five hours of walk from Adjo, he said. Barefoot and with a spear in his hand (a two-meter-long metal rod crushed and sharpened at the tip), he preceded us with a light pace. We followed him and got again into another gorge, down a steep path that ran along one of the walls. From there you could see well our goal: a sort of gigantic grassy "terrace", partly covered with large trees, which interrupted the long rock wall. 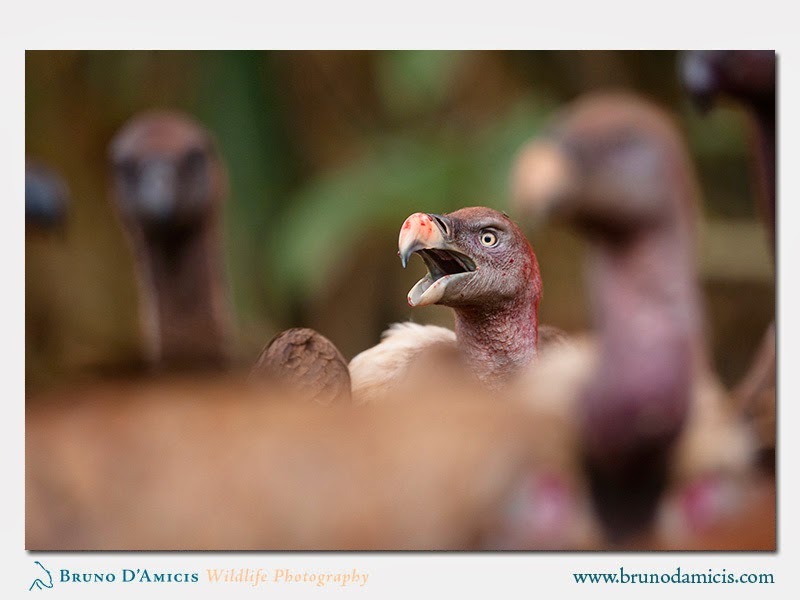 On the cliffs above dozens of white slick denounced the presence of a large colony of vultures. Such a place would have suited well even a Tyrannosaurus rex, I thought. Although my skepticism was chronic, I pondered on the lightness with which my fellows managed such a visit to the very home of the lions. I was wondering if that was something appropriate. Anyway, after what had been one of the most strenuous walks of my first 35 years of life, we reached the edge of the terrace. There we stopped to eat and rest. The shepherd said that we had to climb on the trees and, at sunset, the lions would have come out. So we did, waiting in vain until sunset and beyond: nothing. It was late and I suggested to return. 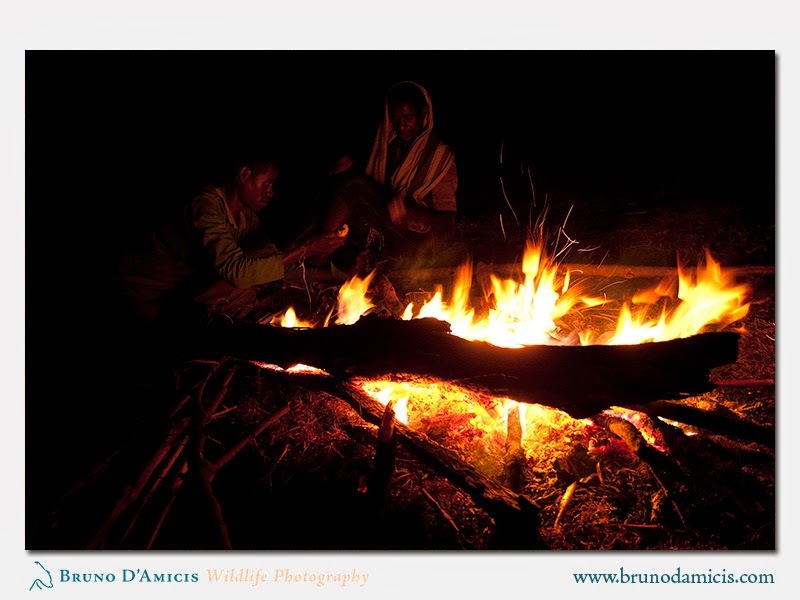 I didn't feel at all comfortable: we were all alone, in the alleged lion area, with just a lamp among four, at more than two hours walk from the nearest settlement and without any equipment to deal with the night. Crazy stuff. We walked our first steps and into the light beam I saw it: a beautiful big turd, exactly like the one of a cat, just fifty times bigger and full of cow hair and bone fragments. A shiver along my back. 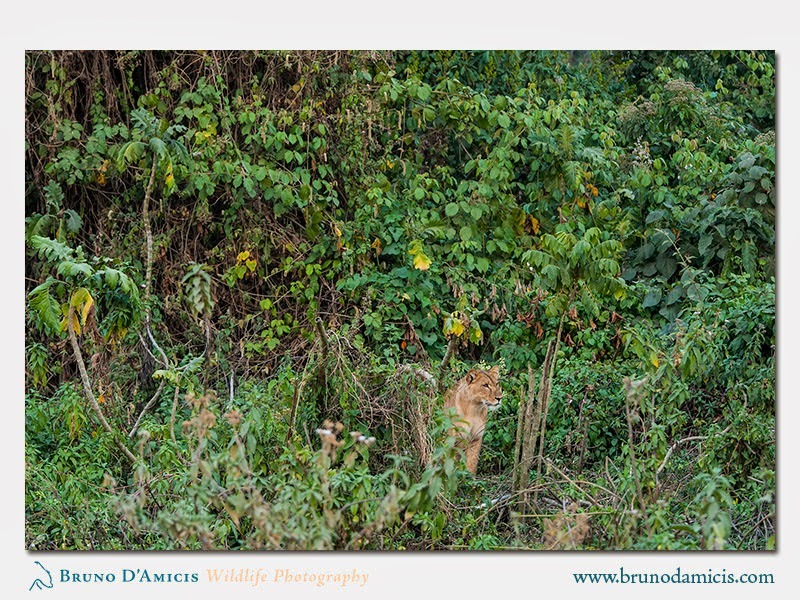 It was then that we heard the first ROAR: a male lion was calling from two to three hundred meters from our position. I was afraid. We had to move quickly to reach a safer place where to spend the night and so we took up a hard and almost onirical march into the most complete darkness, embraced by the velvet warmth of the African night, which was seasoned by a big chirping of insects, the distant laughters of hyenas and the roars of that damn’ lion. I put all my trust in the shepherd, who seemed so confident: I followed him for what seemed like an endless journey through the night, while “we penetrated deeper and deeper into the heart of darkness". So I felt, in fact: like Marlow, the protagonist of Conrad’s novel. The next day arrived way too slowly for my taste and I had enough of it. I wanted to go back home and end it there, but we still had to spend one more night at Adjo and wait for the driver to come from Bonga and pick us up on the next day. 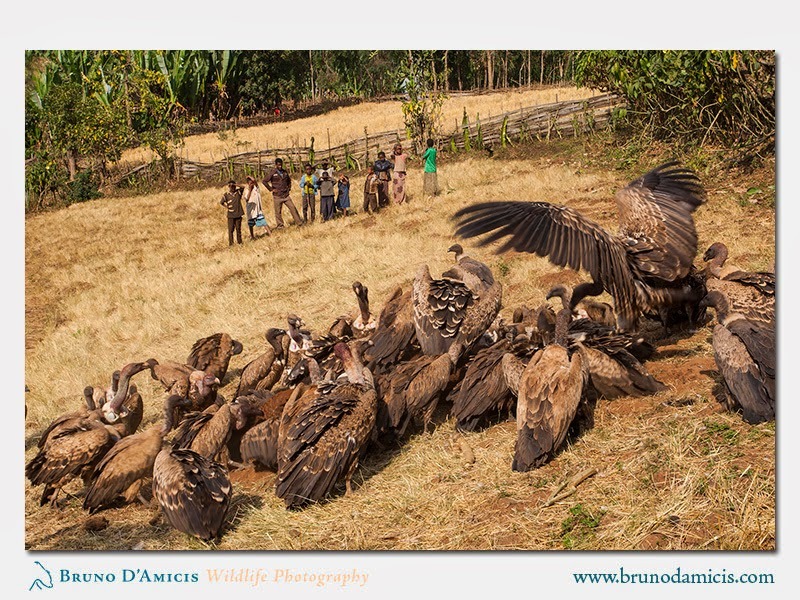 As we returned to the village in the afternoon, I have found dozens of vultures feasting on a dead horse. Not even ten metres from them, a group of children were attentively watching the banquet: luckily, I was no more the main attraction. Then, as the day was fading a rumor spread quickly: ambassa had just been spotted not far from the last houses. We ran there, me, the interpreter and half of the village. And there, on the edge of the forest, half hidden in the lush tropical vegetation, nodded a lioness, as if it were the most natural thing in the world. A vision so beautiful and unusual, which made me wonder if the painter Henri Rousseau had not already experienced something similar in his life. The lioness was huge. After moments of hesitation, I realized that I was not of her interest and, a little reassured by the presence of my companions, I started photographing, first taking a couple of portraits with a long telephoto lens, but, eventually changing to a shorter lens and moving closer. I widened the frame to place the lioness in the wonderful context. I continued shooting until it became dark, then mixing the light from the flash to a portable spotlight. The lioness has moved only once to lay down on a different spot. Finally, we walked away in silence: that was it. 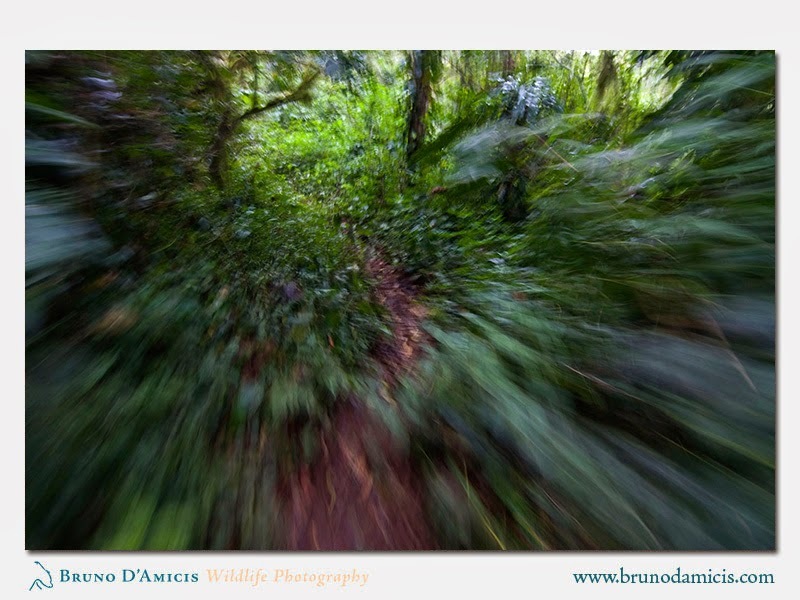 The photographs taken that day probably represent the first visual document attesting the presence of these animals in the afromontane rainforest, at over 2,500 metres above sea level. But the grotesque aspect of this story is also that so much effort would eventually dissolve in just some fractions of a second. Is there a moral to this story? And, in the meanwhile... in the jungle... the mighty jungle... the lion really sleeps tonight! 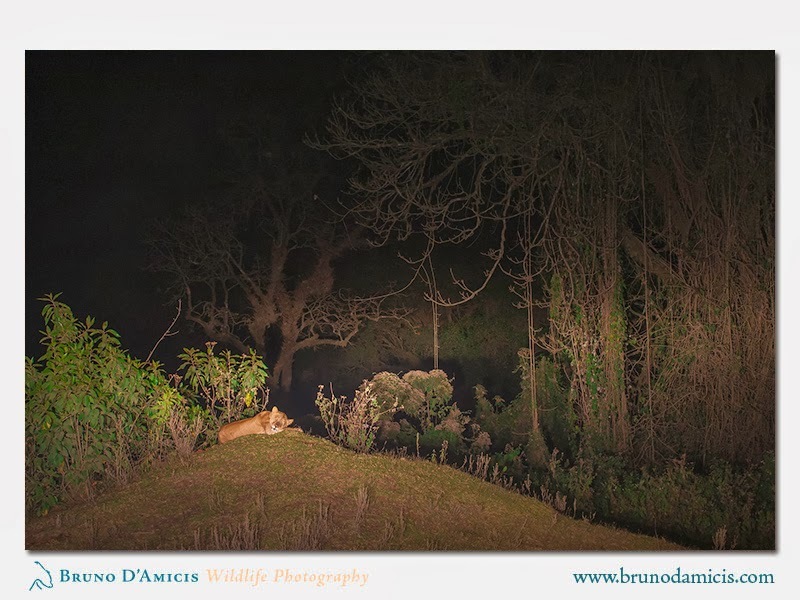 If somebody would ask me to point out what is the main source of inspiration for my profession of wildlife photographer, I wouldn't hesitate and name literature, both fiction and non-fiction, instead of other photography or any other form of art. The freedom words give to talented writers and thinkers in order to express the subtle feelings elicited by nature and animals, articulate their reflections on the world and describe fleeting situations is unsurpassed in my opinion by music and visual arts. As a wilderness "book-oholic" with an ever-growing collection, I have my little circle of similarly-affected people with whom I share the latest releases and virtually unknown highlights. Way too often, we have the feeling that so many incredible findings are appreciated just by a very small percentage of the population and, especially in the case of Europe in general and Italy in particular, those books get known only within a very limited entourage. Wether this happens because of a limited distribution or the barrier of foreign language (and because of the general lack of interest for nature), I often thought it would be worth to share authors and books that I've found exceptional and worth to be widely known. So, here comes the idea to name regularly on my blog a "Wilderness book of the Month". No matter if the book is twenty years-old or freshly published, French or American, writes about food culture or grizzly behavior, I hope to trigger your interest and create momentum for a broader diffusion of wilderness culture! From the back cover: "Alaska’s wolves lost their fiercest advocate, Gordon Haber, when his research plane crashed in Denali National Park in 2009. Passionate, tenacious, and occasionally brash, Haber, a former hockey player and park ranger, devoted his life to Denali’s wolves.He weathered brutal temperatures in the wild to document the wolves and provided exceptional insights into wolf behavior. Haber’s writings and photographs reveal an astonishing degree of cooperation between wolf family members as they hunt, raise pups, and play, social behaviors and traditions previously unknown. With the wolves at risk of being destroyed by hunting and trapping, his studies advocated for a balanced approach to wolf management. His fieldwork registered as one of the longest studies in wildlife science and had a lasting impact on wolf policies. Haber’s field notes, his extensive journals, and stories from friends all come together in Among Wolves to reveal much about both the wolves he studied and the researcher himself. Wolves continue to fascinate and polarize people, and Haber’s work continues to resonate." 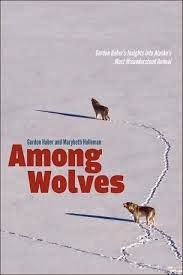 Pardon my ignorance but I didn't know about Gordon Haber and his departure until I stumbled upon his great website: http://alaskawolves.org, and must thank my friend and fellow book-oholic Antonio Antonucci for recommending it to me. This book has been an incredibly pleasant read during a few days of flu and forced bed rest. Although it mostly focuses on Haber's research on wolves in Denali, Alaska, I believe his findings to be of broad interest for all the wolf enthusiasts around the world and his approach to be a very rare example of conservation commitment and scientific clarity. We should all pay homage to this great person and make sure his brave voice won't be silenced. I would like to quote his words at the end of the book, after Haber arguments his position against wolf exploitation: "(…) we are unknowingly destroying the very treasure on which we thrive and, in fact, depend. A sameness results with a numbing of the spirit, and we gradually lose our ability to marvel. The battle to protect wolves or a wild caribou herd, alligators or whales, or another tract of wilderness isn't a plot to lock wilderness and wildlife away. This battle really represents and attempt to ensure that we do not neglect some of our most basic non material needs. It is nothing less than a matter of helping ourselves toward full achievement of the human promise." In this dark age for wolf conservation across Europe and the whole world, I hope these beautiful words will echo in everyone's head. 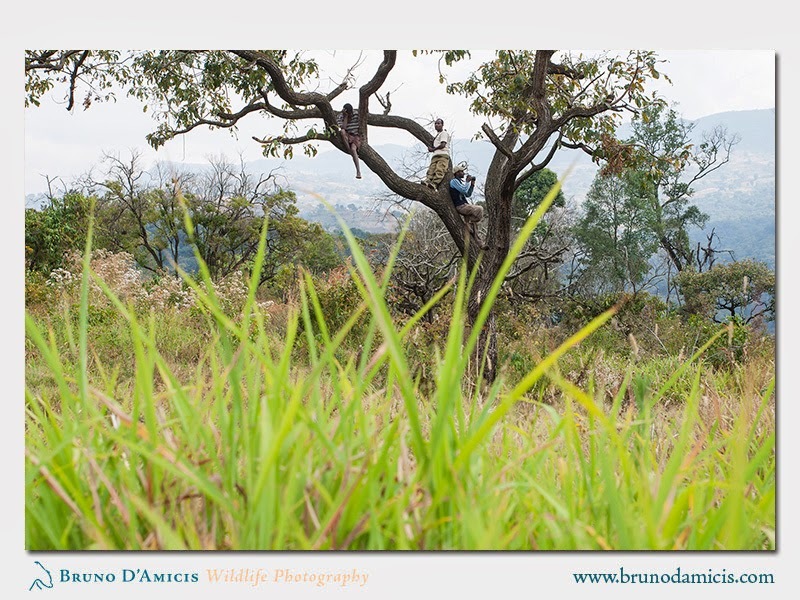 All images and texts ©Bruno D’Amicis 2007-2012. All rights reserved worldwide.. Simple theme. Powered by Blogger.